GH Induction Atmospheres (GH IA) designs and manufactures customized, turnkey induction heating systems for industrial brazing, welding, heat treating, heat staking and many other applications. GH IA is an experienced industrial heating system integrator working solely with induction-based technology. The process of designing the induction heating system, the mechanics to support it, and the the fixturing to move your parts in and out of the heating zone requires an experienced engineering team that is not afraid of innovation. Quite simply, our engineering staff knows induction, and knows how to move parts. We take pride in meeting and frequently exceeding our customer’s process requirements. The first step of our product development process is to determine how induction heating can be integrated into your manufacturing process. Although the basic principles of induction heating theory are well known, it requires many years of experience to refine these principles into cost-effective industrial manufacturing solutions. 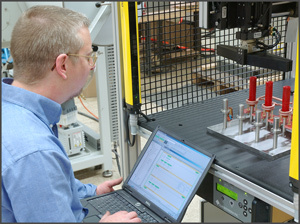 In our Application Lab, we’ll evaluate your part samples and determine the best heating approach. The efficiency of an induction heating system for a specific application depends on several factors: the characteristics of the part itself, the coil design, the power supply’s capacity and the degree of temperature change required. Our engineering staff understands the interaction between the induction power supply, coil, capacitors, fixturing and surrounding environment. We have the experience to take your part and design an induction heating solution around it, determining the optimum coil design, capacitor configuration and power supply for effective, consistent heating. In his four decades of induction heating experience, Dale Wilcox, GH IA's CTO, has worked on hundreds of applications and understands what made each specific job successful. To be able to draw on this broad experience of what worked in the past – and what didn’t work – is a key factor in determining the best solution for each new application. His experience with induction heating technology includes the design of an entire series of induction power supplies. The core GH IA development team has over 100 years of combined experience and has worked together since 1998. After the effectiveness of induction heating for a specific application has been demonstrated in our Applications Lab, our system integration process begins with a two-dimensional concept drawing. With customer feedback, the drawing is refined and expanded into a three-dimensional solid model of the proposed system which clearly shows how the system will move your parts in and out of the heating area. Your Project Manager will coordinate all aspects of your system development and ensure that your budget, schedule and quality requirements are met. As system development proceeds to the manufacturing stage, periodic customer design reviews ensure that there are no surprises at any stage of development. Internal reviews – our entire group of mechanical engineers regularly meet to review each other’s work – ensure that the evolving system design will have the benefit of the entire team’s experience and input. Mechanical Engineers, Control Engineers and Senior Machinists participate in these reviews, while you as our customer monitors and provides feedback on the emerging three-dimensional model via a password-protected website. Our engineers will get to know your engineers very well before your system is completed! Robot Language Controllers PC Control PLCs from Allen Bradley, GE Fanuc, XYCom, NIST, Siemens, Modicon, Automation Direct, Texas Inst. Our engineers know how to move parts. 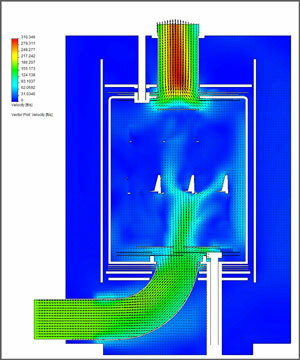 Advanced computer modeling tools simulate flow of gases.